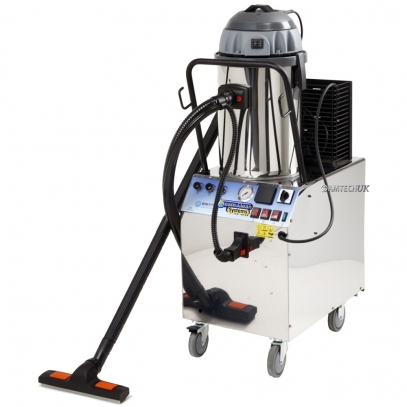 The SC3000 Industrial Steam and Vacuum Cleaner is one of the most powerful single phase steam cleaners on the market today. It has all the power and capacity to meet the most demanding industrial jobs. The SC3000 Steam and Vacuum Cleaner also has a unique pressure water facility which is incredibly useful when a surface needs rinsing or for extraction cleaning. The SC3000 Industrial Steam Cleaner utilizes the latest steam technology and uses very little water with no harsh chemicals, so providing maximum standards of cleaning and hygiene with minimum environmental impact.